Each year, the American Lawyers Alliance (ALA) recognizes three teachers of law-related education as the American Lawyers Alliance Teachers of the Year. At this year’s awards breakfast and ceremony on August 11, 2017 in the Yale Club of New York, the winners celebrated came from a broad section of the country, from the Ozarks to the Upper Peninsula of Michigan. The middle school winner is Cherese Smith from Ozark Junior High School (Ozark, Arkansas). The high school winners are David Alcox, Milford High School (Milford, New Hampshire) and Fred Cole, Marquette High School (Marquette, Michigan). The presidents of the Bar Associations from Arkansas, New Hampshire, and Michigan attended and spoke on behalf of these amazing teachers. Each winner received $1500 and spoke at the ceremony about the programs they have implemented at their schools. 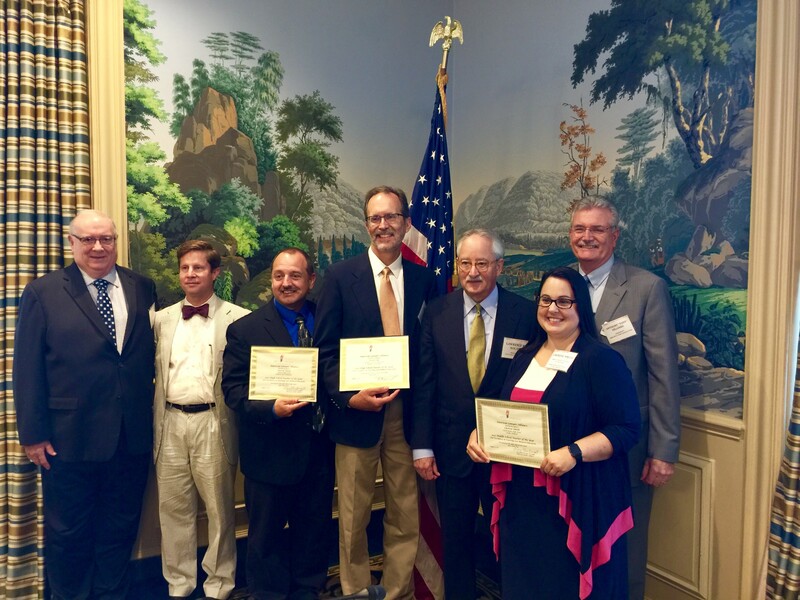 This is especially exciting for the Center for Civic Education, as Fred Cole has been involved with the James Madison Legacy Project as a mentor teacher and David Alcox won the American Civic Education Teacher Award from the Center in 2013. The American Lawyers Alliance is a charitable and educational nonprofit that aims to foster understanding and respect for the American legal system and preserve democracy through citizenship education. For information on the 2018 Teacher of the Year awards, please visit www.americanlawyersalliance.org/annual-awards. Each year, the American Lawyers Alliance recognizes three teachers of law-related education as the American Lawyers Alliance Teachers of the Year. At this year’s awards breakfast and ceremony on August 11 in the Yale Club of New York, the winners celebrated came from a broad section of the country, from the Ozarks to the Upper Peninsula of Michigan. The middle school winner is Cherese Smith from Ozark Junior High School (Ozark, Arkansas). The high school winners are David Alcox, Milford High School (Milford, New Hampshire) and Fred Cole, Marquette High School (Marquette, Michigan). The presidents of the Bar Associations from Arkansas, New Hampshire, and Michigan attended and spoke on behalf of these amazing teachers. Each winner received $1,500 and spoke at the ceremony about the programs they have implemented at their schools. From left to right: Honorable Royce Lamberth, Scott Harris, David Alcox, Fred Cole, Lawrence Nolan, Cherese Smith, and Anthony Hilliard.